Whatever market force brought the Yukon Gold potato to the grocery stores over the past decade or so, I am grateful. 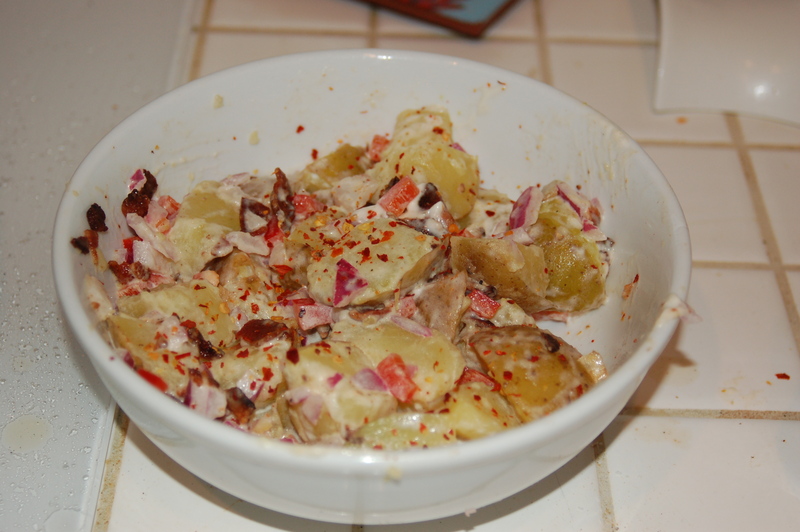 They take potato salad to a whole new level, well away from the realm of the mealy, runny and soggy taters I seem to recall from childhood picnics. Here’s a simple recipe for a side dish for 5 to 6 people. My rule of thumb is one medium-sized (about 2 inches across) potato per person, and then add on 2 extra potatoes. 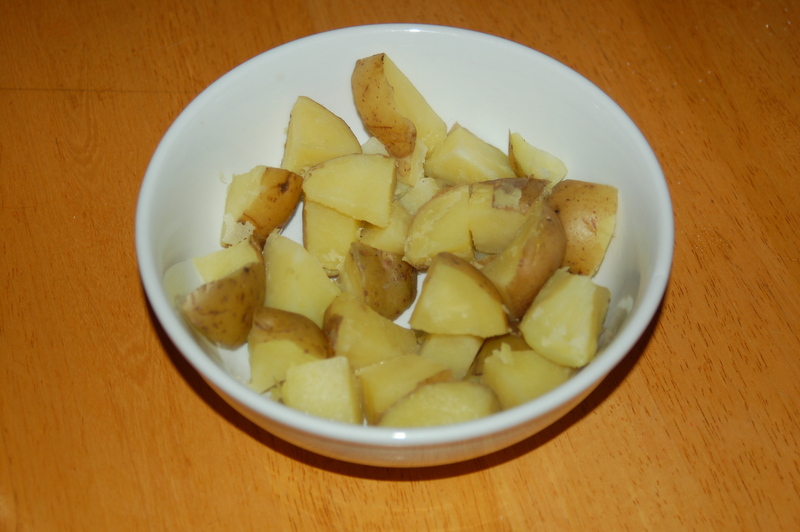 Poke the raw potatoes with a fork so they don’t explode when you steam them. Yes, steam them, no boiling. It’s the only way to avoid that watery texture. If you don’t have a steamer basket, just put 1/2 inch of water in a skillet or saute pan with a tight fitting lid. Place the potatoes in, bring the water to a boil, then place the lid on and reduce the heat to simmer. Check them in 15 minute by cutting one potato in half. It should cut easily. If it does not, put the lid on for a couple more minutes. Take the potatoes out and chill them on a flat plate, no lid on it, in the fridge.When they are cool, cut them into quarters. This allows for your dressing to cover a good amount of potato, without getting gloppy. 3 strips of bacon cooked crisp, drained and crumbled. You are making your own bacon bits, basically. To assemble, douse the cooled, quartered potatoes, in your proposed serving bowl, with the vinegar, about a tablespoon’s worth, or a few good drizzles. Add in the mayonnaise and coat the potatoes equally. 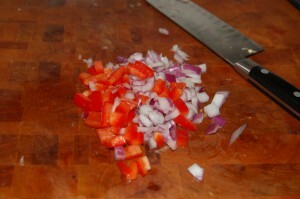 Then mix in the red onion, red pepper and bacon. Finish by shaking red pepper flakes and salt over the salad, to taste. Don’t overdo either one. –omit the pepper flakes for those who hate spice. All the chefs who judge cooking on t.v. talk about how a perfect dish will have it all: sweet, savory, creamy, crunchy and what they call “mouth feel.” Trust me, it’s in that bowl pictured above.